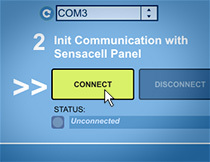 The first step to configuring your Sensacell panel with SensaSynth2 is to establish communication between the software and the panel. First make sure that your panel is powered on and the SensaComm USB adapter is in place (see Setup). Then follow these steps to get started. Your Windows OS will have assigned a serial port to the adapter, which you need to identify using the pop-up menu provided – it lists all available open ports. In many cases, the adapter’s port will be the only open port on the list, but there is no harm done in selecting the wrong port. If there is more than one port listed, you can try them in sequence. If NO ports are listed (the pop-up menu is empty), see the Troubleshooting section below. 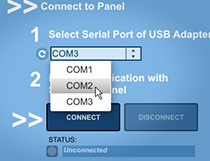 The Connect button initiates the attempt to communicate with the panel over the port selected in the first step above. 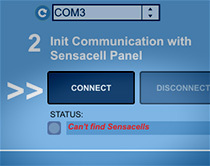 A successful connection will be immediately apparent from the changing Status messages below the Connect button and from the appearance of the Sensacell panel, which is first put through its “Restart Sequence”. If this does not happen, the Status message will indicate that the current port is not a valid port and you can simply try another one. If all the ports return an error message, see the Troubleshooting section below. The handshake provides SensaSynth2 with essential information about the state of the array, which is stored in non-volatile memory on the Master Module. 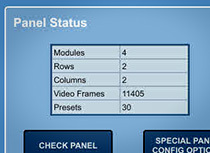 This includes data about the dimensions and layout of the panel as well as the number of presets and frames of video uploaded. Some of this information is displayed in the table to the right of the Connect/Disconnect buttons. Closes the serial port, which is useful if you are trying to temporarily access the Sensacell panel from another software application without closing the program. None of the other sections in the application will work unless the software is properly connected, however. These two buttons have their own separate documentation page. See Check Panel and Configure Panel. Check that the panel is powered on and the SensaComm USB Adapter is correctly in place (see Setup). Click the “Refresh” button next to the Port Selection pop-up menu, wait a few seconds, then check if a new port has been added to the list which you can try. Pull out the SensaComm USB adapter from the USB port on your PC and plug it back in again. 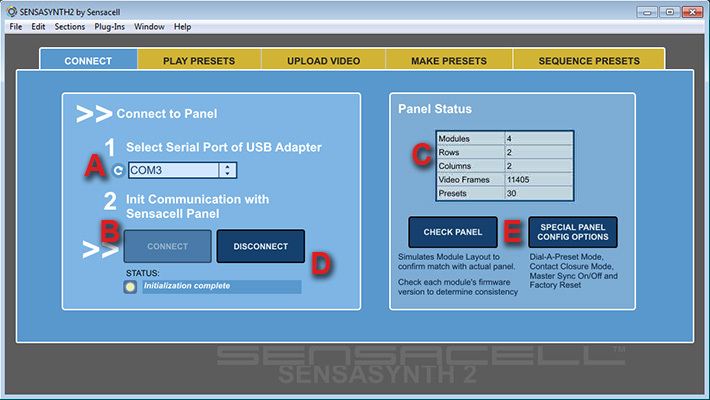 If none of the above work, try powering off the Sensacell Panel, closing SensaSynth2 and unplugging the USB adapter. Then (in this order) plug in the Sensacell Panel, insert the SensaComm USB Adapter into an open USB port on your PC, then re-open SensaSynth2.